Limed oak kitchen cabinets recall a mid-20th C oak furniture finish that’s finding a new audience. Oak cabinets are inching their way back into kitchen fashion after having being painted or ripped out and sent to recycling for most of the last decade. But they’re not the same shiny-orange builder’s-grade boxes found in tract homes. Limed oak kitchen cabinets are the newest look which is light and subtle — though it can be ebonized – with a matte or satin finish. 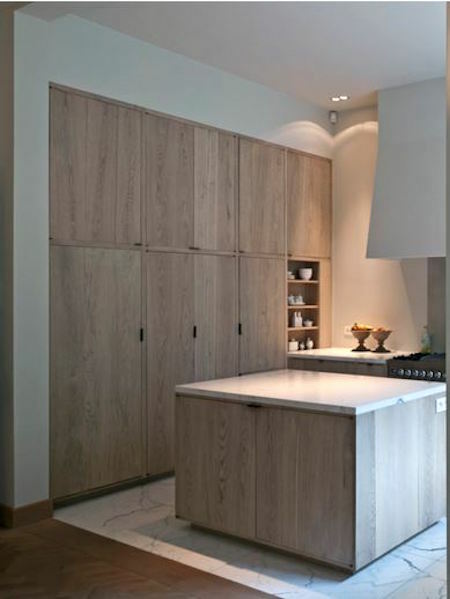 Limed oak reads as natural though the oak grain is highlighted or washed with white pigment. 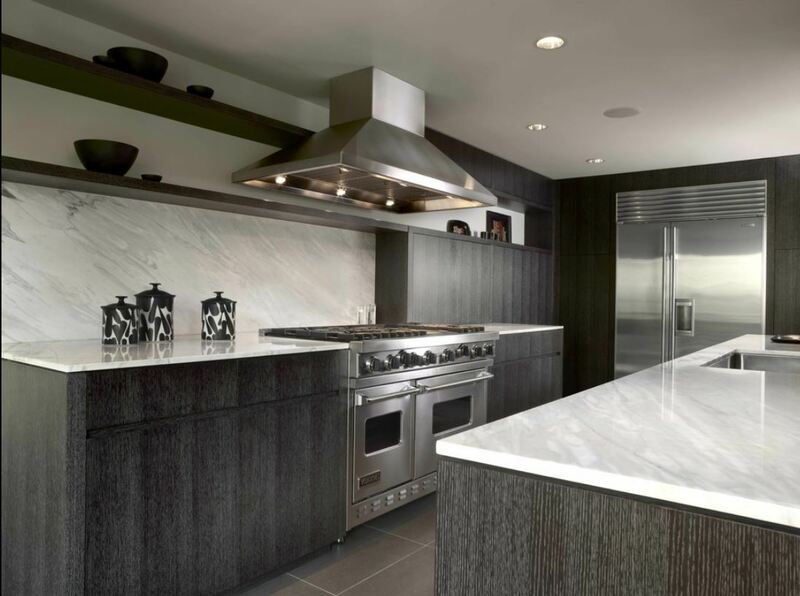 L.A. celebrity designer Jeffrey Alan Marks created an elegant transitional French oak kitchen [top], showcasing the blond oak on the cabinets. The vent hood is tucked behind a custom limed oak panel. Planked limed oak on the island is beautifully matched to taupe-gray polished marble. 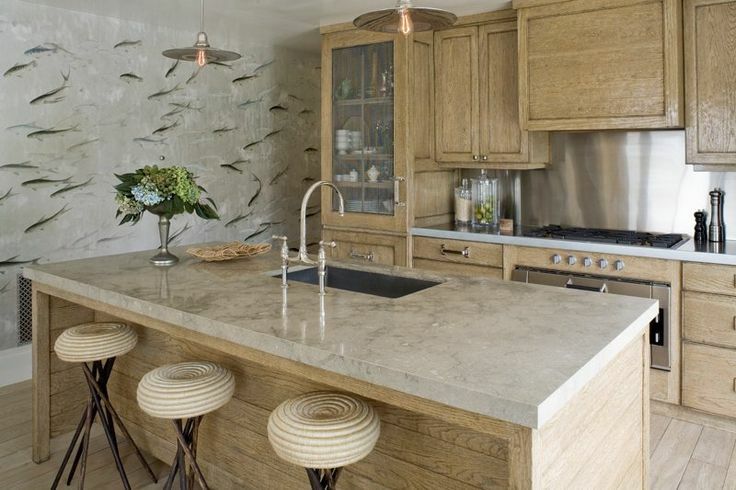 The theme in this kitchen is sophisticated and highlighted by a wall of supernal Degournay swimming fish paper with a silvery background. 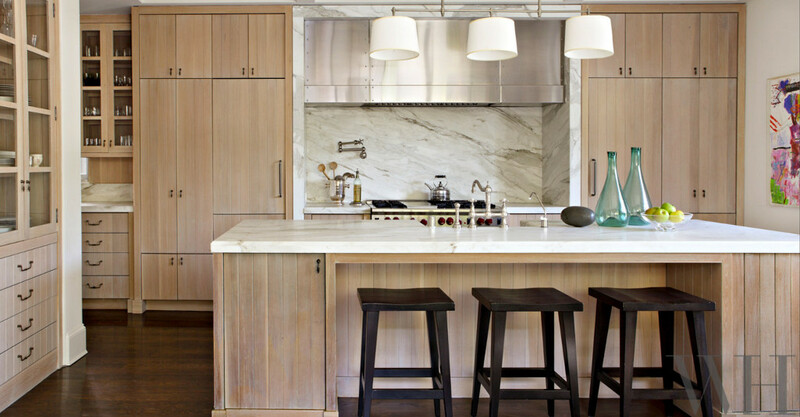 Luxe drawer hardware and natural-fiber seats on the counter stools keep the look consistent. Natural French oak, and particularly cerused or limed oak finishes, began a slow creep back into kitchens from the high-end furniture market after oak pieces by mid-20th century design icons Jean-Michel Frank and others hit their height as collectibles around 2007. Ideas can take a while to trickle down and, inevitably with revivals, there are variations and reinterpretations made possible by development of new products such as stains, glazes and waxes. Originally, lime (an ingredient in mortar) was used to highlight the wood grain. So was white paint pigment (whiting) made from chalk and mixed with wax. When white lead was used the surfaces were called cerused. Other products, including diluted paint and various stains also may be applied. For practical purposes the terms and whitening materials are interchangeable today. This close up I took of a 40s-era Jean-Michel Frank table up for auction at Christie’s shows exactly how the rift-sawn grain of the wood is filled in. Cabinets in a minimalist kitchen in Antwerp offer a modern variation on the cerused theme by reversing it. The doors are gently whitewashed while the grain is tempered to the oxidized gray of old wine casks. 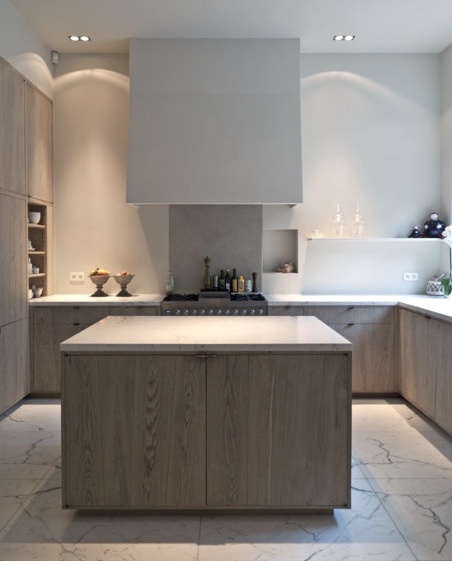 Another view of the kitchen shows the subtle effect of the finish on a big, slab-front pantry-cabinet wall which gives the effect of the natural wood look Belgians love. But it’s not natural, it’s tweaked. 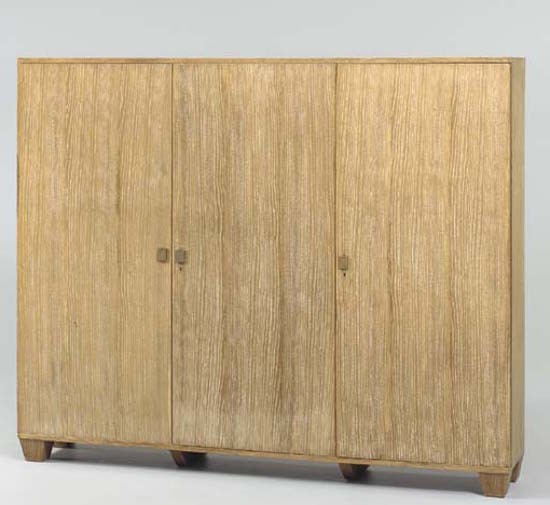 And here’s the vintage inspiration — a Jean-Michel Frank minimalist cabinet that sold at Christie’s in the $30,000 range. 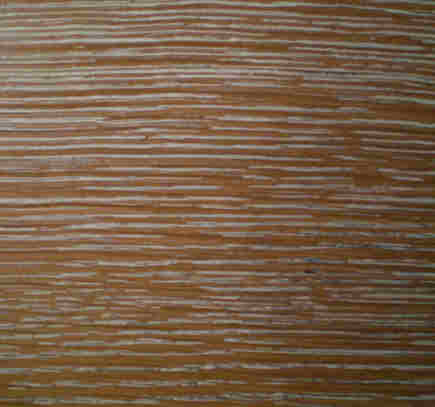 This finish varies with the wood grain – which results from the way wood is sawn. 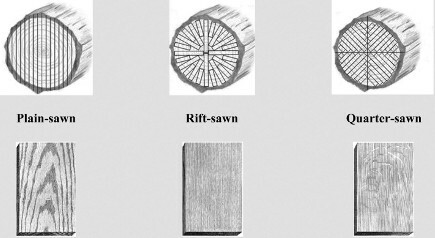 An Oak 101 chart shows the distinctions between the ways oak is milled. There is plain sawn, quarter sawn or rift sawn oak. Plain-sawn is standard and rift-sawn the most highly prized. Each produces wood with a unique grain. Overall whitewashing – as opposed to highlighting – yields a pickled look, which I happen to love. 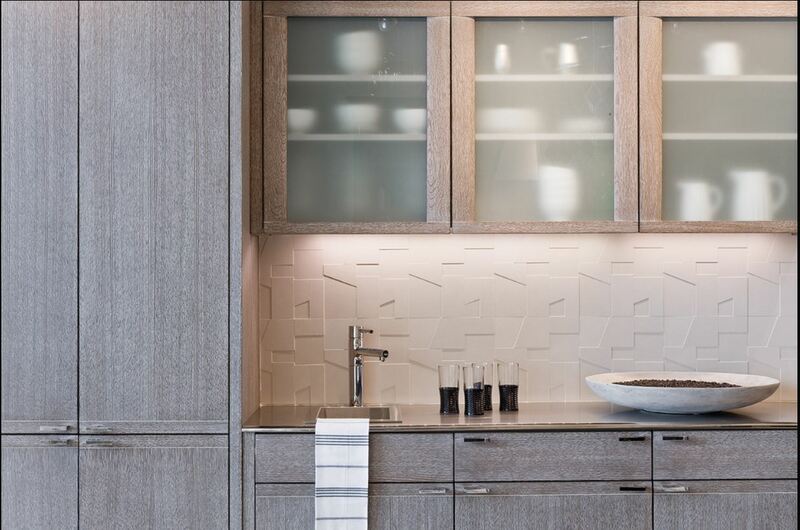 A gray undertone helps keep the undesirable pink undertone out of red oak (white oak is blonder) and the result is hip enough to harmonize with techy 3D porcelain Geologica backsplash tile. Fans of black-and-white modernist kitchens may go for partially ebonized and cerused oak cabinets. Dark oak also marries well with marble and is more forgiving than the currently trending black lacquer kitchen cabinet finishes. Cerused, rift-sawn oak planks give country-style batten cabinets an unusually mellow look that blends well with calacatta marble countertops and backsplash. It’s amazing how as the entire space with a crisp, modern look. I can’t help but think that Jean-Michel Frank, creator the straight-edged Parsons table during his tenure at the New York City design school of the same name (also my alma mater), would be pleased to see the way his furniture style progressed into fitted cabinets for one of the most-used spaces in the house. Hi, any chance you can throw perspective on this and give us the measurement of this island? I don’t have the dimensions but, by my eye, I would say it is likely 10 feet long and 6 feet wide. What product did you use to lime the cabinets ? Briwax has a liming wax, included in the TOH list. The rest is hand work to the extent that you want to go. Good luck! It can be a great project.